Pavlova, and by association, meringue, always seemed to me a bit of a strange dessert. I don’t know whether it’s the confusing texture (it looks like whipped cream…but is actually firm and crispy) or the variance of consistencies (is it flaky and crunchy, or gooey like marshmallow?? ), but meringue just never really appealed to me growing up. And that was despite how pretty all those pavlovas looked, stacked high with their impressive whipped cream and fruit. That was, however, before I learned to make my own. 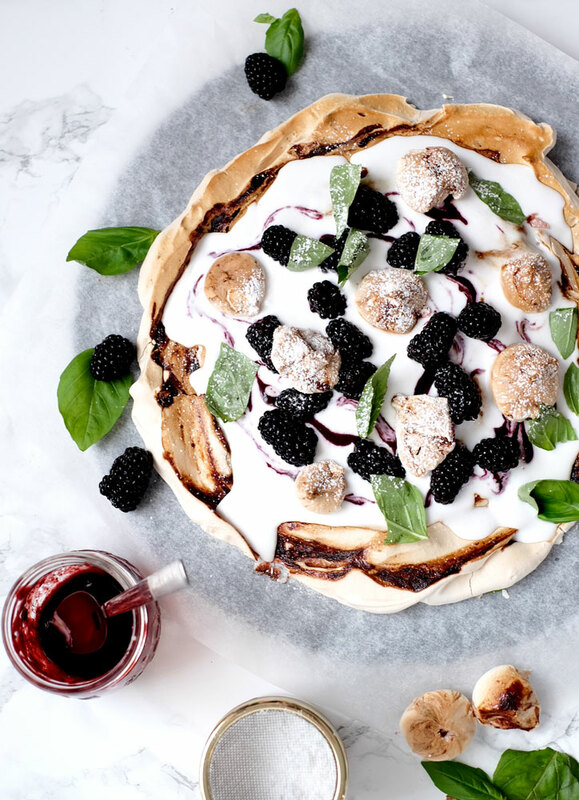 Recently I was invited to try this gorgeous vegan blackberry pavlova recipe by Marks & Spencer, and I might go as far to say it has changed my mind on this whole dessert! I now know what all of the fuss is about. And I now also know why cooks can talk at length about all the different ways to perfect (or not perfect) a meringue…! Though this was my first time making a pavlova (and it did come with some learning curves), I would honestly recommend this recipe to anyone, even if you’ve never made meringue before. 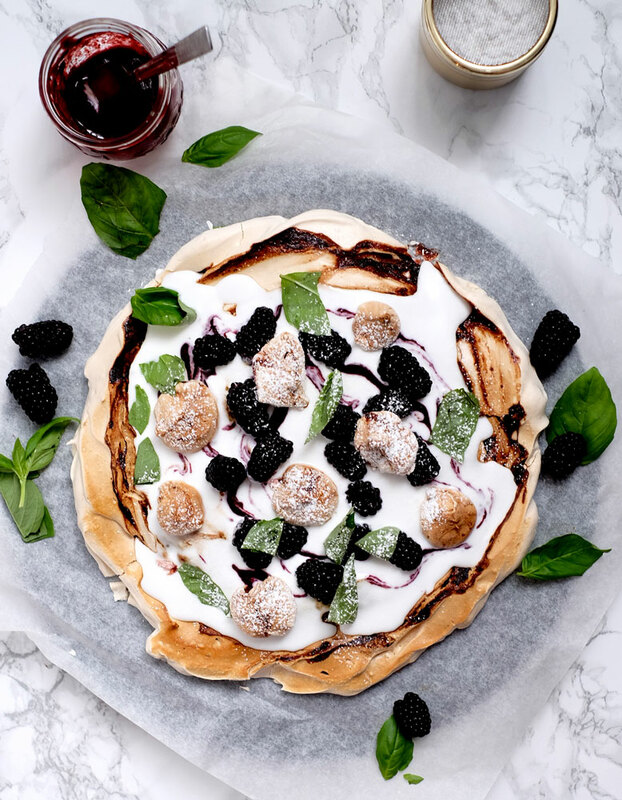 The crispy yet melt-in-the-mouth meringue base is topped with fresh whipped coconut cream, juicy blackberries, light-as-air vegan meringue kisses, and fragrant basil leaves, offering a beautiful and cruelty-free twist to this classic dessert. 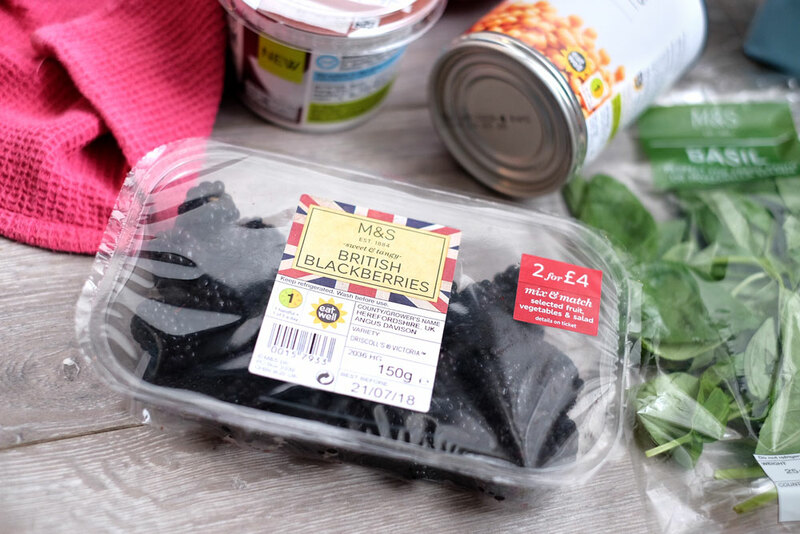 M&S champions British berries and with summer being a time to celebrate provenance, they are offering more ways for people to incorporate these delicious seasonal fruits into their diet. They are also committed to the sustainable sourcing of British ingredients, and have with worked with some of their berry suppliers for over 40 years, working with farmers that have been farming for generations. 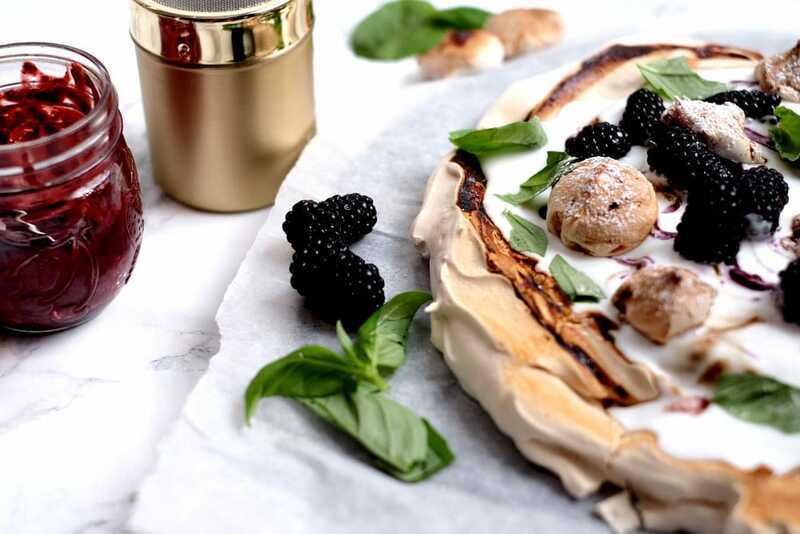 Since this pavlova is vegan, it’s made with entirely plant-based ingredients and is better for your health and the environment. All you need to do is enjoy it! Not only does this dessert look pretty show-stopping, it tastes delicious too, making it great to take to a gathering or serve to guests during summer. Believe me, they’ll never know it’s vegan till you tell them! Some people may be surprised to learn that it’s possible to make a meringue without egg whites. The truth is that you absolutely don’t need animal ingredients to make delicious desserts, and meringue is no exception. The secret ingredient is aquafaba – also known as chickpea water. This might seem very strange, but the starch and protein from the chickpeas that have migrated into the water make it perfect for being whipped up into a sort of vegan ‘egg white’; a light, fluffy and airy cream that is fantastic for vegan meringues and souffles. According to the Aquafaba website, the liquid contains just three to five calories per tablespoon and one gram of protein. It’s a great alternative for reducing the amount of saturated fat and cholesterol in recipes, as well as cutting down on food waste. And it’s cheaper than eggs, too! 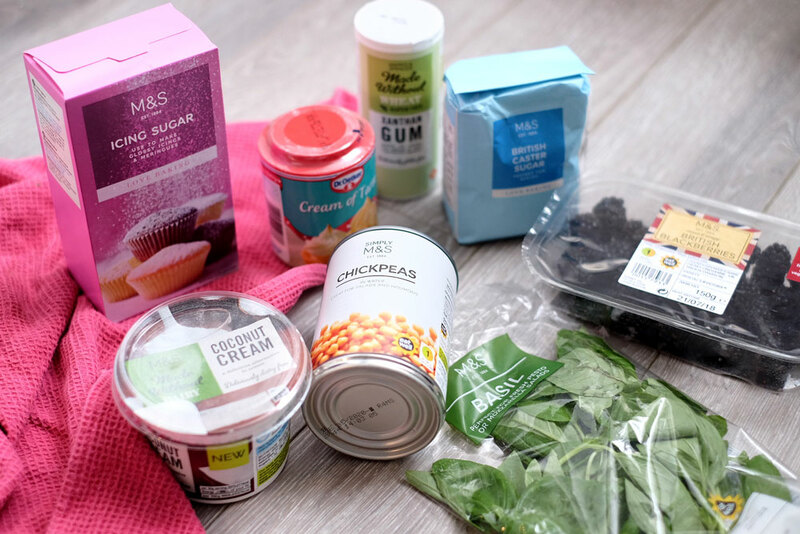 Look up ‘aquafaba recipes’ online and you’ll find plenty of uses for the stuff – including chocolate mousse and of course, aquafaba meringue! If you’re skeptical, try this easy peasy vegan meringue recipe first. You’ll soon wonder why you ever did it any other way. Though I did experience some hiccups making this dessert (being a meringue rookie, and all) I’ll say don’t be put off by the ingredients. 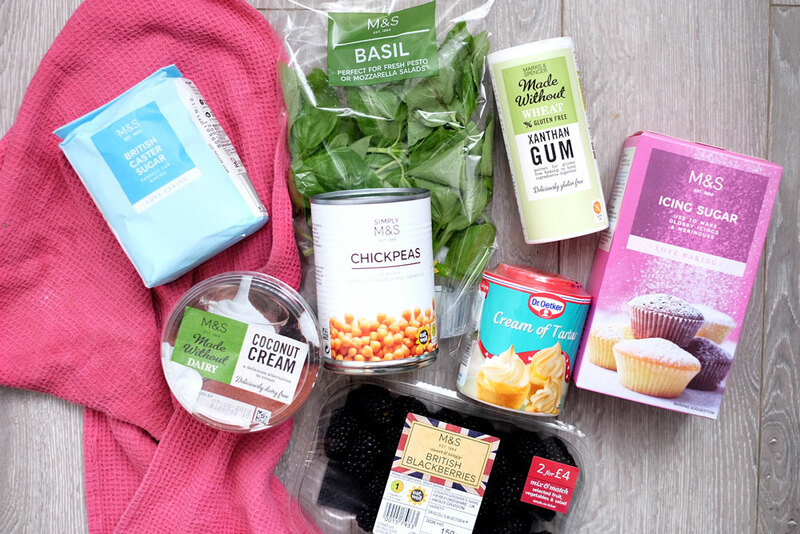 They’re all really easy to find in most supermarkets (including your local M&S), and you probably already have some of them in your cupboard. I’ve added a few notes at the bottom so that you can learn from my mistakes. For those of you that are used to making meringue with egg whites, you’ll probably be an old pro at this, so feel free to roll with it how you see fit. If you make it, be sure to post your results on Instagram! Use #everythingspeachy and #cookwithmands so we can see your creations :). 1. Heat the oven to 120°C (100°C fan/gas ½). 2. In a food processor, blitz 150g of the blackberries with the icing sugar. Sieve and set aside. 4. With an electric whisk, mix the chickpea liquid, xanthan gum and cream of tartar for a few minutes, until thick and fluffy. It should reach the point where you can see stiff peaks and can hold the bowl upside down over your head. 5. Whisk in the caster sugar, 1-2 tbsp at a time. 6. Fold in 2 tbsp of the blackberry coulis carefully. 7. Line two baking trays with baking paper. 8. Use an icing bag or spoon to pipe mini meringues on one tray (about 8-10). Then spread the rest of the mixture in a circle on the other. 9. Bake the large main meringue for 3 hours and the small ones for 1½ hours. 10. Turn off the heat, and leave to cool in the oven completely. 11. 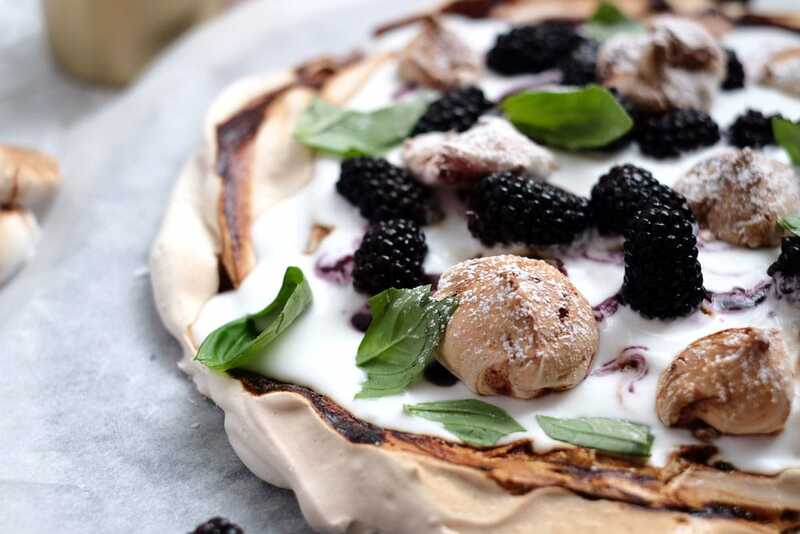 When ready to add your toppings, whip the coconut cream until thick and spread over the meringue base. 12. Top with the rest of the blackberries, the mini meringues, blackberry coulis and basil leaves. Dust with extra icing sugar. An electric whisk is pretty essential for whisking the aquafaba. I tried with a hand whisk at first, but after an hour of whisking it still wasn’t thick enough and my meringue fell into a gooey mess. I got an electric whisk for £5.49 from Argos, and it was perfect for this recipe. When making the main meringue base, try to spread it quite thickly on the baking sheet – about 2 inches. As you can see from my images, I spread mine a little too thinly and it was more like a pizza base. The meringue doesn’t rise when cooked so it’s better to make it on the thicker side, for a more robust base later on. Whip up the coconut cream (either using the electric whisk or by hand) to get it nice and thick before spreading. I wished I’d done this step as mine was more like pouring cream. Once the meringues are cooked, try grilling them on top for just a minute or two to get a delicious golden caramelisation effect. What did you guys think of this recipe? Have you ever made a vegan pavlova before? Let me know your thoughts in the comments below!